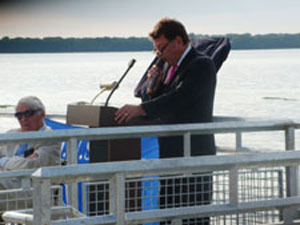 On Tuesday August 21, 2012 the Erie Western Pennsylvania Port Authority held a dedication ceremony for the Liberty Pier Fishing Access Area. 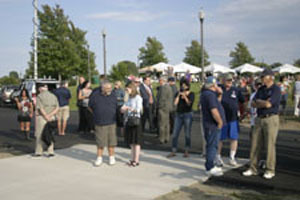 The ceremony was held prior to the start of the “Eight Great Tuesdays” event. 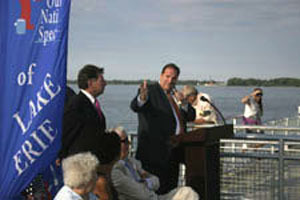 Port Authority Chairman, Jeff Johnson presided over dedication. 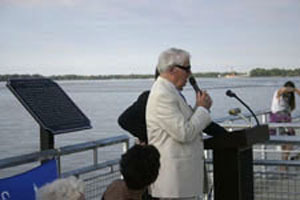 The pier was dedicated in the honor of Ed Mead for his the long service as a Port Authority member. Ed has served since the early 1960’s when it was called the Erie Port Commission. Authority president Jeff Johnson spoke about Mr. Mead’s long and dedicated service. He also referenced the hard work and dedication by the S.O.N.S. 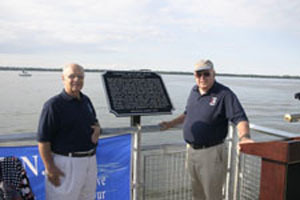 of Lake Erie who spear headed the project. 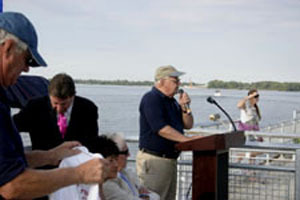 County Executive Barry Grossman and Mayor Joe Sinnott also spoke and alluded to the roll that the S.O.N.S. played in the event. S.O.N.S. President, Jerry Skrypzak spoke last and congratulated Ed Mead and thanked him for his many years of service to the community a EWWPPA board member but also for his great work as a journalist. 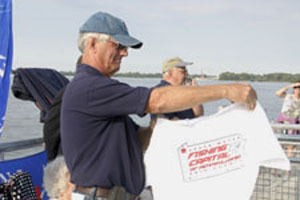 Jerry presented Mr. Mead with a 2012 edition of the SONS of Lake Erie T shirt with the “Freshwater Fishing Capital of Pennsylvania logo” He told the crowd that this great designation had been proclaimed by the Pennsylvania Legislature earlier this spring. “Erie County has been and still is the destination of thousands of fisherman each year”, he said. 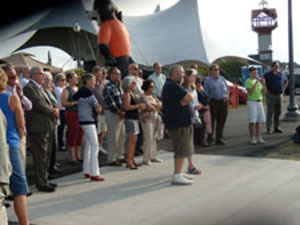 He went on further to say- “This Public Access Fishing Area on Liberty Pier is here thanks in part to these fisherman whose license fees are used to support the Pennsylvania Fish and Boat Commission’s Lake Erie Access and Habitat program. The PFBC has allocated over $378,000.00 from the Lake Erie Access and Habitat Program towards the completion of this project. We owe a great big thank you to the PFBC and the over 60,000 fishermen whose five dollar license fee contributed to this program. Skrypzak also thanked the EWPPA for their contribution of $150,000.00, the Coastal Zone Management Program for its contribution of $75,000.00, the Pennsylvania Department of Conservation and Natural Resources for its contribution of $100,000.00, the PA State House of Representatives, the Friends of Fish Foundation and lastly he thanked the S.O.N.S. 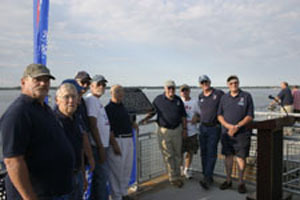 of Lake Erie’s officers, directors and its 3000 members. He also thanked Ashley Porter Engineering and Chivers construction for a great job. Earl Myers (ctr) Head of the PFBC's Cooperative Nursery Division presented a 25 year participation certificate to SONS President Jerry Skrypzak and SONS Director and Hatchery Manager Bob Zawadzki. The certificate marks our club’s 25year affiliation with the PFBC’s cooperative program. 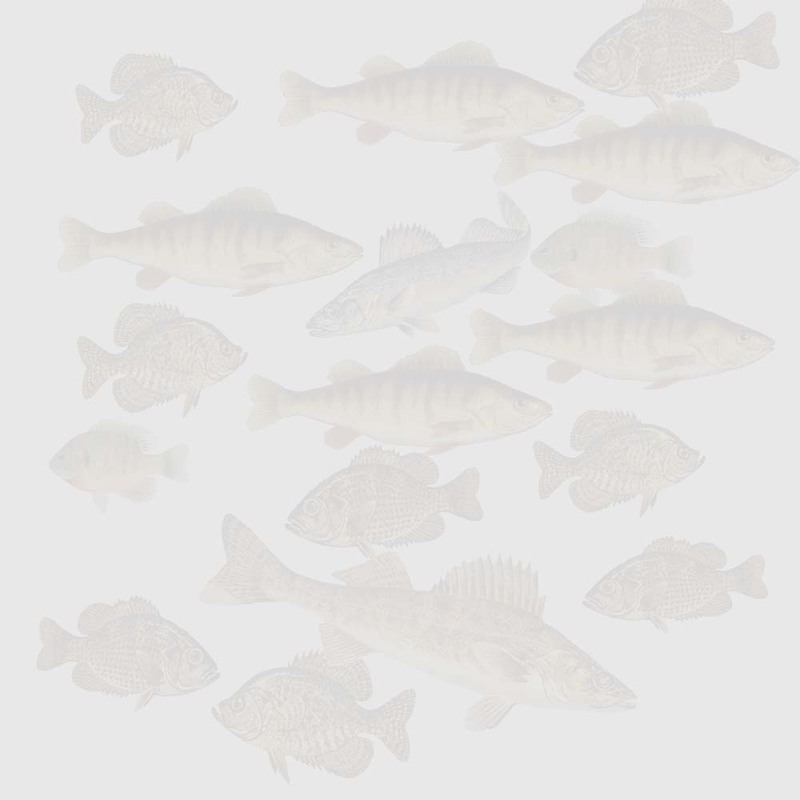 In 25 years our hatchery has produced over 25,000,000 walleye, 30,000,000 perch and over 1,000,000 steelhead fry. 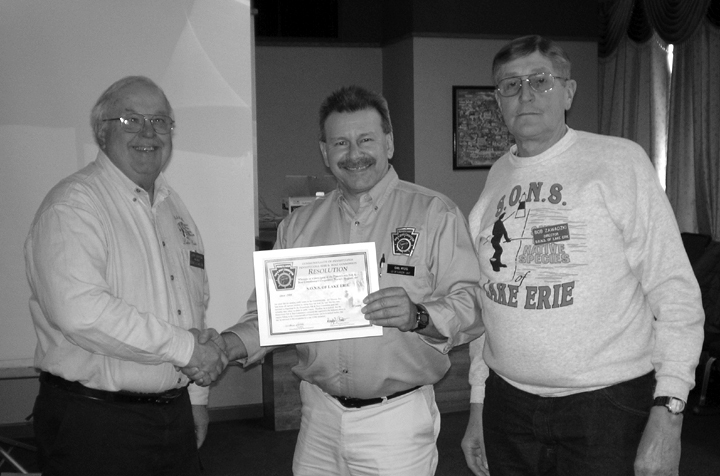 The certificate was presented at the March 14th Commission’s biennial cooperative nursery meeting in Oil City. Two of the PFBC’s patrol boats are sporting new radar units thanks to the S.O.N.S. of Lake Erie. Last year some Lake Erie fishermen lost their lives because of the length of time it took to locate them and their capsized boat. We felt that had more boats with radar units participated in the search the outcome may have been different. On request of our regional WCO’s it was decided to upgrade two of the PFBC’s patrol boats with new state of the art Raymarine radar-gps units. The S.O.N.S. portion of the price tag was $5,589.00. Technicians at Anchor Marine did the installation of the units. The S.O.N.S. 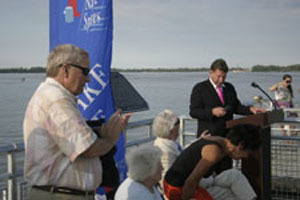 of Lake Erie were presented with the “Advocates for Independent Living Award” at the October 21, 2009 Annual Meeting of Erie Independence House Inc. Ms. Cathy Elizabeth Miller, President of the Erie Independence House presented the award to the S.O.N.S. 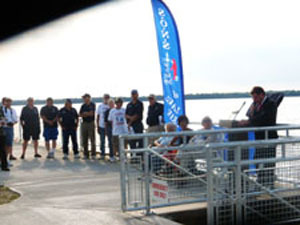 in recognition of several past projects that have provided access and hands on fishing opportunities for the handicapped. 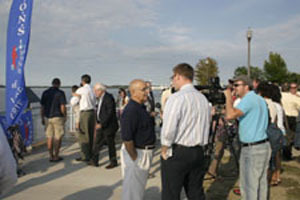 Some of these projects include the construction of a bridge and ramp on the South pier and a handicapped ramp on the North pier. The S.O.N.S. also contributed funds toward the construction of the floating fishing platform on Presque Isle’s Waterworks pond. S.O.N.S. 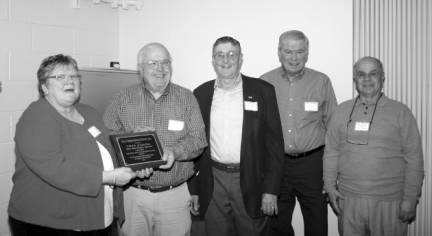 President, Jerry Skrypzak and Vice President Ed Kissell were presented the “Sportsman of the Year Award” by the Northwestern Pennsylvania Sportsman’s Coalition. 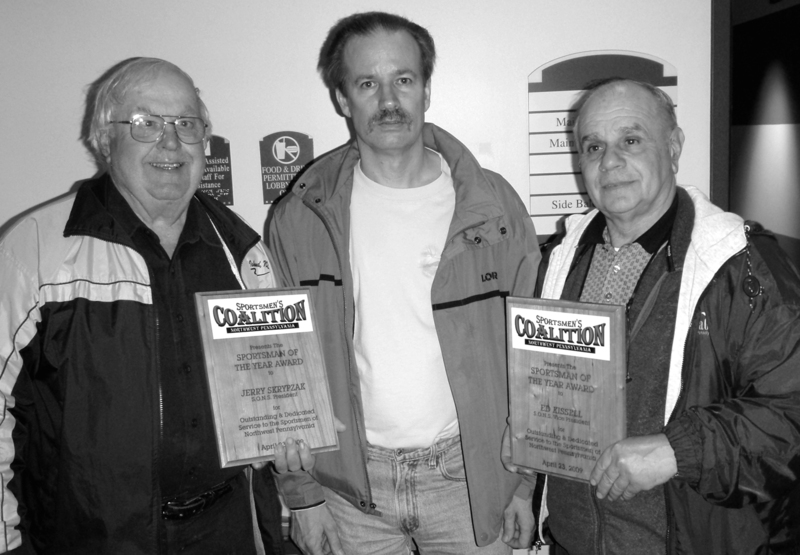 The presentation was made by Coalition President, Ron Dombrowiak, on April 23, 2009 at the Regional PFBC informational meeting, which was held at the Hirt Auditorium.